Read... Write... Talk... | Reading, Writing, Sharing is what its all about! One of my most beloved babysitters is starting her student teaching next week. I had her as a student in 8th grade and now I can’t believe that she will be starting her student teaching experience. She asked me for advice, so I thought I would share some of the things I shared with her. It will be hard. It just will be. Balancing life, teaching, creating lessons, grading, and knowing the content. It will be hard, but you WILL SURVIVE! Find some people who can support you emotionally, to keep your spirits up, and also find someone who you can share ideas, and talk out your plans with. This could be your mentor teacher, it could be a peer who is also student teaching or someone else you know who could support you in this way. Be open and honest with your mentor teacher. When you first meet your mentor teacher, make sure you let them know any areas you are feeling nervous about (classroom management, specific content you will be teaching etc..). Their purpose is to help and support you grow. They were in your shoes once. Be OK with not knowing everything- it is OK to tell the students, “That is a good question, I’m not sure about the answer” or “Let me look that up.” or, “I’ll have to check to make sure I’m thinking correctly.” If you tell the students you are going to check on something, make sure you do and you come back with the information. Ask questions when unsure. Don’t assume, just don’t. Ask questions about schedules, plans, ideas, assessments, it’s always better to double check than to tell the students something wrong, or to plan for less time than you thought etc… Just ask. Be professional: This means, show up early, do what is expected of you, put effort into your work, don’t make excuses, have your plans ready to go when you say you will, write down important dates in your calendar, check and use your email. Don’t rely on your mentor teacher to remind you about an IEP, staff meeting or an event you need to attend, and don’t try to be cool or overly friendly to your students. You will feel more confident and be a better teacher if you take charge and take on the professional role. Be careful on social media. It is awesome and has its place, but it can be devastating to you as a professional. Go through your accounts, make them private, check things you are tagged in, be careful what you post, retweet, or like. Make it so that students can’t find your account when they search for you (because they will search and request to follow you). As you are planning and creating, make sure you save your files in a way that you will be able to find them in the future. Put documents in files to keep it all together. Do it now and be as specific as you can. You will find that your files will pile up very quickly and you will want to keep your ideas and documents together by topic or unit. Find some good Professional Learning Networks online (Twitter, Instagram, Facebook) you will find lots of inspiration there. Watch as many other teachers as can. See how they set up their room, use their space, how they use time efficiently, how they transition from one activity to another etc… You can learn so much (what to do and not to do!) from observing someone else. Don’t reinvent the wheel add your own spices to the lessons and ideas given to you by your mentor teacher. Reflect, reflect, reflect! You are not going to be perfect during your lesson delivery. No expects you to be. After every lesson think back to what you would have done differently. Make your handouts engaging. Make the heading large, make it a font that isn’t Arial and boring, make the directions easy to understand, and make sure the format of the handout is easy to understand. Do the assignment yourself following your directions. Try to get your mentor teacher to co-teach with you. You will really learn so much more and can see how an expert handles the lesson with you. There is definitely a time to solo teach in the room all to yourself, but when you first start out, see if your mentor teacher is willing to co-teach with you. As hard as it may be, plan out your goal of what content and material you want to cover for the week. Make sure that you also look at the big picture of when the unit or topic needs to be completed. Use backward design so that you are guiding students towards the end goal for that unit or topic. If you know the big picture of all topics covered, you can keep your eyes open for books, resources, ideas you may need as you are teaching. Use a paper notebook or a digital notebook like Evernote to keep track of your ideas and plans you have. Sometimes I will hear about a book, listen to a podcast or read an article that relates to what I am teaching. Jot it down so that you can come back and find it when you are ready. Sometimes in the middle of teaching, or as you are driving an idea will strike you- write it down. There is so much going on in your brain, there is a chance you will forget it if you don’t write it down in some format. After writing this, I realized that much of this applies to all teachers. We are always on the journey to improve. Good luck new teachers, you’ve got this! At the start of each quarter I have my students think about the reading they have done in the past few months, and how they can improve themselves as readers. I have my students participate in the 30 book challenge, but I also think it is important to chunk such a large goal into 4 smaller mini goals. I have my students set manageable goals they feel they can accomplish in our 9 week quarter. I challenge my students set a number of books reading goal, and choose another aspect of their reading where they feel that can improve. In the meantime, if you would like to get some good book recommendations for your students, follow me on Instagram at mrshagedornreads. I give a book talk to my students every day, and many of the books I post on the Instagram account are books I share with my kids. Do you have a must read or great recommendations for your students? Add your recommendations below! Books You Need to Read to Change How You Teach! I have spent a lot of time away from this place, but I miss it and I want to share some things that I have been up to…. Here are some professional development books that I have been reading this summer that I HAVE to share! If you don’t know Penny Kittle and Kelly Gallagher as inspiring educators, you need to check this books out. I have read many of their other books, and highly recommend them all. Even though they are both high school teachers, this book is easily adaptable to middle school. These two teachers, who teach across the country, planned an entire year of teaching together. They share their ideas, what they learned and what they would do differently. I got so many ideas, and even tweaked some of the things I normally do after reading this book. I have to admit that at first I wasn’t interested in reading this book. I thought, I don’t do whole class novels, so this book isn’t for me. I was WRONG! This book has so many ideas to improve my reading instruction and to help me guide my students through their independent reading, short stories we read together, literature circles (or book clubs), and read alouds! This book is a must read as we teach kids in today’s world. Packed FULL of ideas on how to help students see beyond their world and to understand others. What I like about this book, is it is full of lesson ideas and you can do an entire unit on this, or sprinkle the lessons throughout the year. This book is going to guide new literature circle/ book club themes and topics for the coming year (more on that coming up!). What are your favorite professional development books? 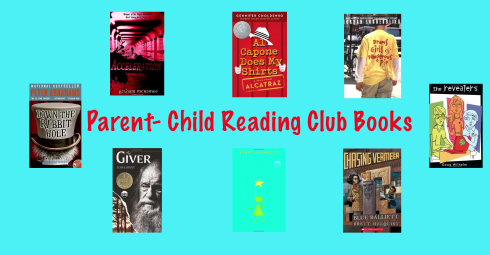 Parents- Kids- Reading- it’s a book club! When you say parents, middle school students, books and reading some believe that it equals a recipe for disaster. Well, a few years ago a co-worker and I decided to try out this recipe- we created what we called a parent-child book club (still hate the name, but we couldn’t come up with anything better). We decided to see if there was an interest in having parents and students read the same book and then come together for an evening of book discussion, activities, snacks and reading fun! We found out that there were many parents and students who were interested in this type of program, and we’ve had a lot of really great nights where we all share our love of reading (even if we all didn’t love the book!). We’ve definitely tweaked it over the years, but hopefully you can take a look at our recipe and see if there are some ingredients you may want to add to your school to create your own reading program that involves parents and their kids. GOAL: Get kids and parents reading, talking, thinking, and sharing in the magic of reading together. We also felt that many parents didn’t know about some of the excellent young adult books that are out there and the power of young adult literature. We wanted the event to be stress free, fun, centered around the pure enjoyment of reading a book and sharing that enjoyment with others. We also wanted parents to be able to see their kids do some of the kinds of activities that are done in language arts classes. 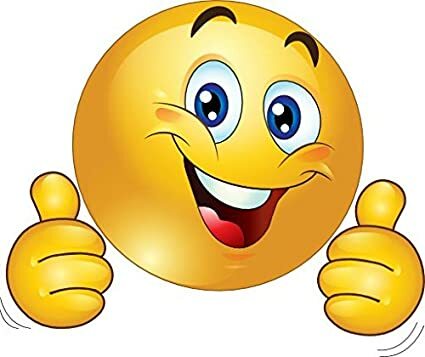 PREHEAT: decide ahead of time on a book that would be appropriate and appeal to boys/ girls/ adults, 6th -8th graders and would lend itself to discussion and activities related to the book. We also tried to vary the genre each time. Once we figure out a book that would work, we had the students come and check out the books from us. We let the students take a book home for themselves and their parent (s). If we were short on books, they were allowed to check out one book per family. LET RISE: give enough time for both the parents and students to read the books before the parent- child book club night. BAKE: Once a quarter in the evenings from 7-9pm in the school library. STIR IN: Some fun! We always had a discussion element, but then mixed in a variety of activities that somehow related to the book. Parents and students both participated in these activities. When I say students below I refer to both students and parents. EXAMPLES of the types of activities we did were. Book titles we used the activity for are in parenthesis. Trace hand and put on wall a memory you don’t want to loose (The Giver). Create a time capsule for present day. What would we put in it for people to open up in the future as that they can understand the past (The Last Book in the Universe). LET COOL: at the end we gave each person a survey to get suggestions on future books we may consider reading, suggestions for the future, what kinds of activities worked well and what the participants enjoyed the most. We also book talked the next book and gave the date of the next meeting. PRESENTATION: We always had a visual that related to the book around the room. We also tried to wear something that related to the book (black and white and hints of red for the Giver). We gave the parent/ child team a list of discussion questions so that as they read, they could talk about the book. We never collected these, or expected the participants to do these before hand. This was just an extra for them if they cared to do it. *** We received a grant to help fund the cost of this parent-child reading program. Many parents said that they would be willing to pay to come, or to put money into a fund so that we could purchase the books. The books then were shelved in our library so that students could check them out, or teachers could use them as literature circle books. PTA or school funds may also be able to help fund this type of program. Here is a neat idea to collaborate poetry and art.Traveling Stanzas is a really neat project that the Kent State University design team and some local schools collaborated on. 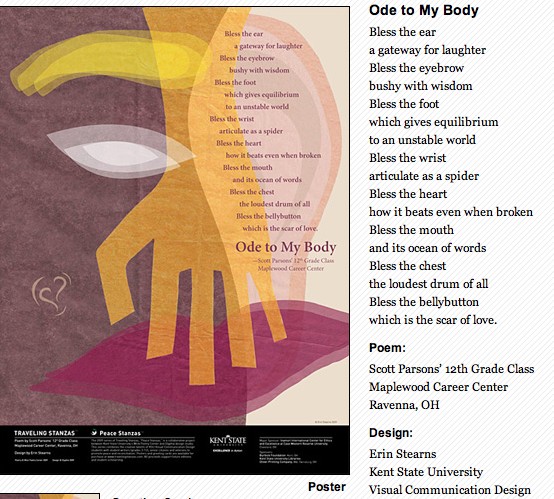 Students wrote poems and then sent them to the Kent State graphic art students. The Kent State students then took the poem, interpreted it using a variety of color, graphics and images to represent the poem. The poems are great examples that I use when we mine for gold, but the art really brings out the poem. I am collaborating with our art teacher and our writing groups and writing poems, and her art students will interpret and design the piece. If you don’t have an art teacher, or don’t want to take on such a big project, start small and have the kids illustrate their own, or illustrate another classmates. I am really excited to see how this turns out! Check out Traveling Stanzas to see the poems, art work and even purchase cards if you are interested. I am a BIG believer in reading picture books to my students. Students of all ages can appreciate a story read aloud and can reap the benefits of hearing a fluent reader. Here are a few of my favorite Figurative Language picture books. I like to have my students create their own picture book story and incorporate as much figurative language into it as they can. My students love to read, share and look through these while they are writing and we are working on figurative language. Some Smug Slug– by Pamela Edwards- We had a lot of fun trying to find the S hidden on each page. I put the book on the Elmo so everyone could see! Parts, More Parts and Even More Parts by Tedd Arnold. We laughed as we read this book! A young boy doesn’t quite get figurative vs. literal language. When his dad asks him to Lend a hand- he thinks his dad wants him to cut off his hand! The Library Dragon by Deedy. This book has some great vocabulary words, idioms and puns. All The Places to Love by MacLahlan- this book creates rich images using similes. What are some other good picture books you use for figurative language?